Hooray! More firearm fun today! In case you missed part 1, go read here. We’ve also got part 3 and part 4 when you’re done with this one. 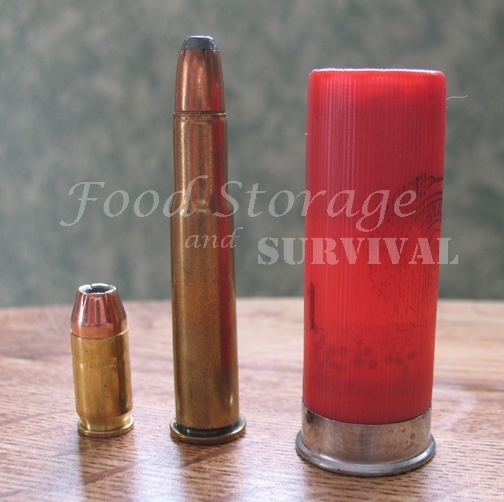 Today we’ll be covering the basics of ammunition, so we’ll discuss three types of ammunition (pictured left to right): Handgun, Rifle, and Shotgun. Handgun and Rifle ammunition are built very similarly. They have a brass case that holds a charge of powder in it, a primer at the bottom, and a bullet at the top. The full bullet/powder/case/primer setup is called a cartridge or sometimes a round (as in “a round of ammunition”). They’re also frequently called bullets, although technically the bullet is only one part of the full cartridge. Mostly larger cartridges are centerfire. The smallest cartridges are what’s called RIMFIRE. .17’s and .22’s are in this group. They do not have their primer in the center, but have it in a ring around the base of the cartridge (on the rim of the base=rimfire). 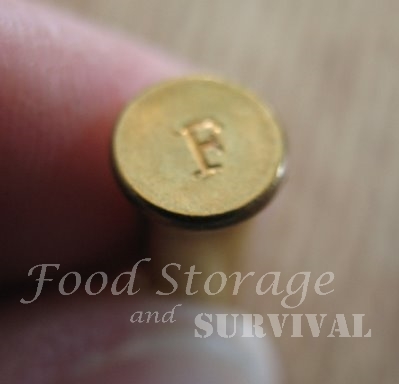 The following picture is of the bottom of a .22 rimfire cartridge. In order to fire this round, the gun’s firing pin will hit the edge of the base to ignite the powder. A handgun is a gun that can be held and fired with one hand (not that that is the best or most accurate way to hold or fire them, but just that they can be). It generally does not have a stock and the barrel is shorter than a rifle or shotgun. Other words that refer to handguns are pistol and revolver (although a revolver is only one type of handgun). Did you notice the .22 LR (Long Rifle) round is in both pictures? Some bullet calibers can be fired from both handguns and rifles, and the .22 is one of the most common. 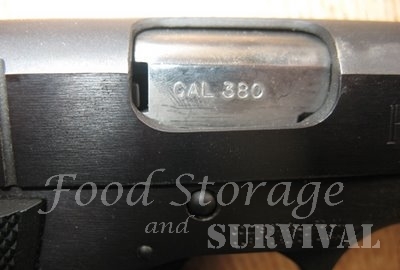 So what is CALIBER and what does it mean to me? All those numbers in the bullet names refer to the caliber of the bullet. Caliber is a measure of the diameter of the bullet and is measured in inches or millimeters. So a .22 cartridge is less than 1/4 inch in diameter and a 9mm cartridge is 9mm in diameter. Every gun’s barrel has a certain inside diameter (called the bore size) that will only fit ammunition made that same size. Every gun is made to fire a specific caliber of bullet. This is also called “chambering” so if you hear someone’s gun is “chambered” in 270, you’ll know that’s just the size of bore it has and is the size of ammunition it takes. If you try to load and fire a bullet that is larger than your gun’s bore, you can have a nasty explosion on your hands. So ONLY use the ammunition specifically made for your gun. How can you tell what ammunition you have? USUALLY it is stamped on the base of the cartridge. This picture is of two different makers’ .380 Auto round. They have the name of the manufacturer and the caliber stamped on them. 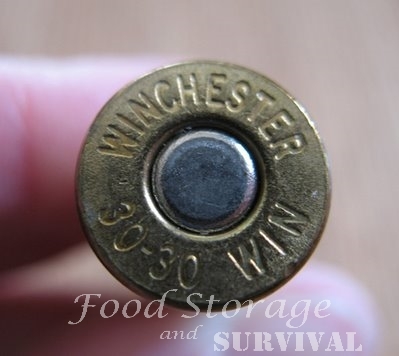 The rimfire cartridge I showed did NOT have .22 LR stamped on it, only F for Federal–the manufacturer, so I guess you can’t always tell your caliber by looking at the bottom, but this is the exception. Look for it–make sure it matches the ammunition before using it! Now we’ve talked about the different kinds of primers and calibers of bullets, let’s look at a couple of common kinds of bullets. Bullets are usually made of lead and covered with copper or some other metal. If they are fully covered, like the one on the right, it is called “Full Metal Jacket” or FMJ. 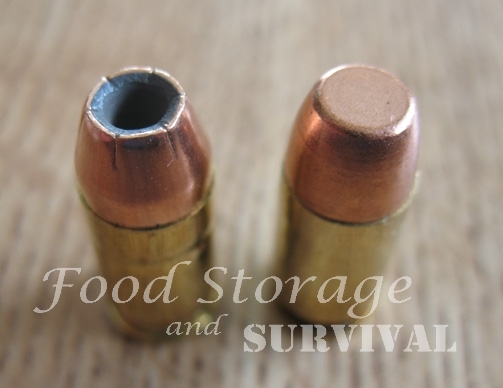 If they have the tip hollowed out like the one on the left, they are called Hollowpoints, Jacketed Hollow Points, or JHP. FMJ rounds shoot similarly to JHP rounds until they hit the target. Hollowpoint rounds are made to expand when they hit the target so they cause more damage and do not shoot through the target as often. These are the rounds you want for self protection and hunting. FMJ rounds are less expensive and are great for target shooting for fun. Finally, we’ll cover Shotgun Ammunition, also called shotgun shells. Shotgun bores and shells are measured in gauge, where the number refers to how many lead balls that diameter would be needed to make a pound. So a 12 ga. is larger than a 20 ga. since if you had a pile of 12 balls that weighed a pound and a pile of 20 balls that also weighed a pound the balls in the 12 ball pile would be larger than those in the 20 ball pile. Make sense yet? Smaller gauge number, larger diameter. 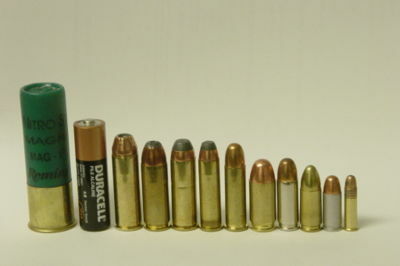 Shotgun shells are built similar to the handgun/rifle cartridges except for a few differences. They have a primer and case, but a shotgun case is plastic. The powder is the same, but the shotgun shell has a “wad”–another piece of plastic to separate the powder from the shot. The shot is a bunch of little balls usually of steel or lead and can be purchased in various sizes. Some shotgun shells are loaded with a bullet called a slug instead of shot. Then the plastic is folded over and sealed at the top to hold it all in. 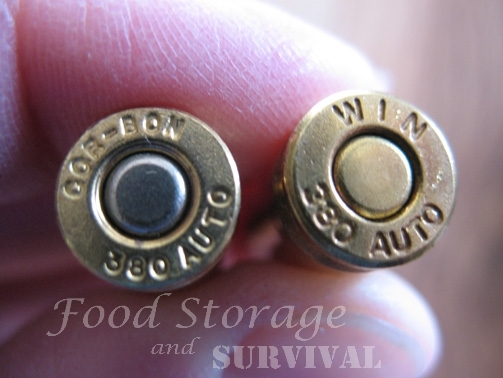 We keep our ammunition in Military style ammunition cans that we get at the local military surplus store. We sort the ammo based on caliber. So each caliber has it’s own ammo can. I thought full metal jacket refered to the more rounded cartridges, while the more pointed ones were soft points…. Many Preppers were not “gun people” to begin with. These sorts of fundiments are invaluable for them. A bit more on bullet types, and weights, perhaps? Also some warnings about penitraion of things like interior walls? The fact that many high powered rifle rounds can bust up bricks, and cinder blocks. Did you warn that overshoots can travel for many miles and still kill? 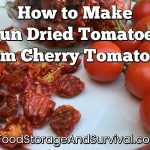 Very good information for people who are interested in emergency preparedness or prepping in general but aren’t that familiar with firearms. Those of us who write about prepping and survival sometimes forget that not everyone who is concerned about preparing for a major crisis has a firearms background. Good for you for doing what you can to help education them!